So the day finally came when I was given free reign over the Indians beat, and it was quite the experience. Coming off a 10-day road trip, the regular Cleveland beat writer was given a much-needed two days off, leaving me to handle Tribe coverage for the first half of a four-game set with the Angels. As luck would have it, those turned out to be two of the busiest news days we’d had all summer. I wrote A LOT. After that, there was a flurry of news. The team made a roster move, the great Tony Gwynn passed away — my editors wanted reactions from around the league on that — and I found out Cavaliers guard Kyrie Irving had been scheduled to throw out the first pitch. He even showed up for a little photo op in the clubhouse. 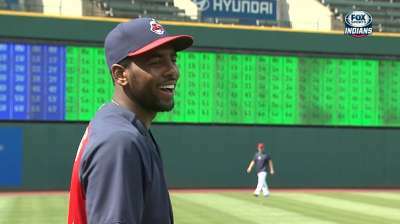 Kyrie doesn’t look too bad in a Tribe jersey. From here, normally all you have left is a running gamer and write-through. However, I wound up filing a handful of short news posts while also trying to, you know, watch the game. 1 – The AL All-Star ballot update came out. Michael Brantley was still on the leaderboard, so that warranted a small story. 2 – Brantley got pulled in the fifth inning with a “mild concussion” — if any concussion can truly be considered mild. Short update filed. 3 – Asdrubal Cabrera had a home run confirmed by replay review. We’re expected to write something brief about any review or challenge that happens during the game, so that was another story. 4 – On top of all of this, the team put out a press release stating that it had signed one of its top draft picks. So that was obviously deserving of a write-up. By the time I had started my running gamer, it was the fifth or sixth inning. It definitely wasn’t my best, though luckily I was able to make up for it in the write-through. I got to write about the Indians winning the game on the all-too-rare seven-out save — from a long relief man, no less. On to Day 2, when (surprise!) the team officially announced it had signed four more of its top draft picks, including the first-rounder. Surprise No. 2 came when I learned that all four were in Cleveland and would be available for an impromptu press conference. 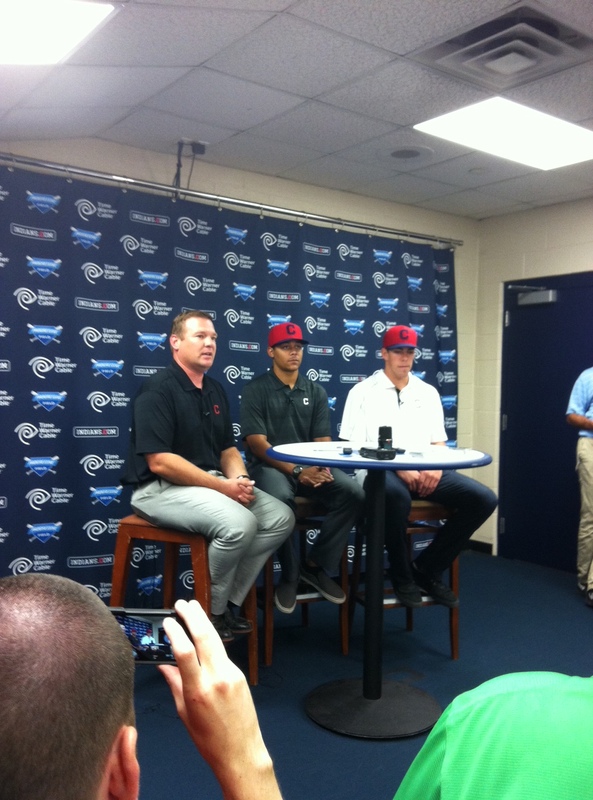 The guy in the center: Justus Sheffield (Gary’s nephew), an 18-year-old pitcher from Tennessee who got $1.6 million for signing. So in addition to the regular notebook, I wound up writing a pair of feature-y stories on the draft picks. I had actually broken the story that the third-round pick (a high-schooler) was planning to sign with the team about two weeks earlier, so it felt pretty satisfying to see him in Cleveland with a finalized contract. Once again, I didn’t get everything filed until the game had started, because there was a lot to write about each. My multi-tasking abilities have gotten top-notch this summer. That might have been the most I’ve ever written in a two-day span, but it was still an incredibly rewarding experience to have. I feel like it’s pretty rare for an “intern” to be given that type of freedom on the job, and it’s reassuring to know you can handle a heavy workload by yourself. I’ll be on my own again — for three days this time — starting Friday. Yes, I’m working the 4th of July. The price we pay.